The projects / assignments in this list have not been screened or approved by the faculty yet. The descriptions are as submitted by clients. Students should actively examine whether it will be possible to develop a project into a suitable Graduation Assignment. If you want your assignment listed below, contact afstudeerbank-io@tudelft.nl. Philips is looking for a graduate to explore potential future scenarios (5-10 years ahead) of how Radiology departments could be adapted to inspire, motivate and retain Millennials in a better way, and to develop new services and solutions that add value to these new working environments. TU Delft is looking for a graduate to develop and test a setup for virtual art experience for a wide variety of artworks in in collaboration with a Dutch artist collective and a company experienced in offering virtually enhanced artistic experiences. TU Delft, and Homie are looking for a graduate to improve (Product-As-A-Service model) washing machine interface to stimulate sustainable use. Exact is looking for a graduate to research user/trust relation in the evolution of AI, and design a method, service or product that helps Exact to measure trust in the existing and to be designed future products and features. CrossGuard is looking for a graduate to investigate the possibility and feasibility of the “ideal” ultracustomized batch size one production, and develop guidelines for ultra-personalized products from a business and manufacturing perspective. TU Delft is looking for a graduate to explore and design the ceramic material experiences for 3D printing by implementing the material driven design method. TU Delft is looking for a graduate to develop and evaluate a cooling solution for the Dutch national field hockey goalies, primarily by applying PCM in the helmet and behind the body protector. iCOV is looking for a graduate to design and test concepts intended to improve the user experience of conducting and communicating analysis of fraudulent and criminal activities. Philips is looking for a graduate to assess and improve the repairability of the Philips consumer product portfolio. Amsterdam UMC is looking for a graduate to redesign the care information path of patients in contact isolation, in which patients have a more active role. If required, request for other days/times. 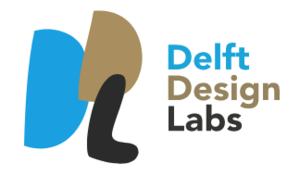 The Delft Design Labs offer interesting graduation opportunities in different areas of design research. Check out their webpage! 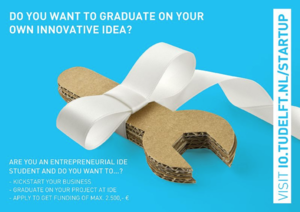 Are you an entrepreneurial IDE student and do you want to...? Would you like to develop your ideas about the optimum balance between consumer convenience and environmental impact? 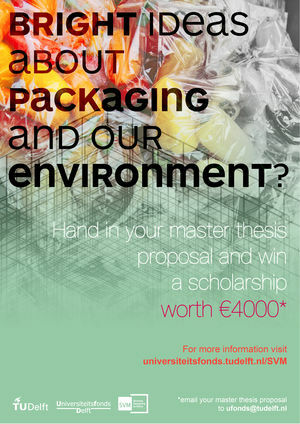 Apply now for the SVM Packaging and the Environment Scholarship and win a scholarship of €4000 for your master thesis project!